I recently planted some tomato plants and although we are a long way away from harvesting tomatoes in our own backyard, just the thought that fresh, local tomatoes are right around the corner got me craving some sliced tomatoes and mozzarella cheese. 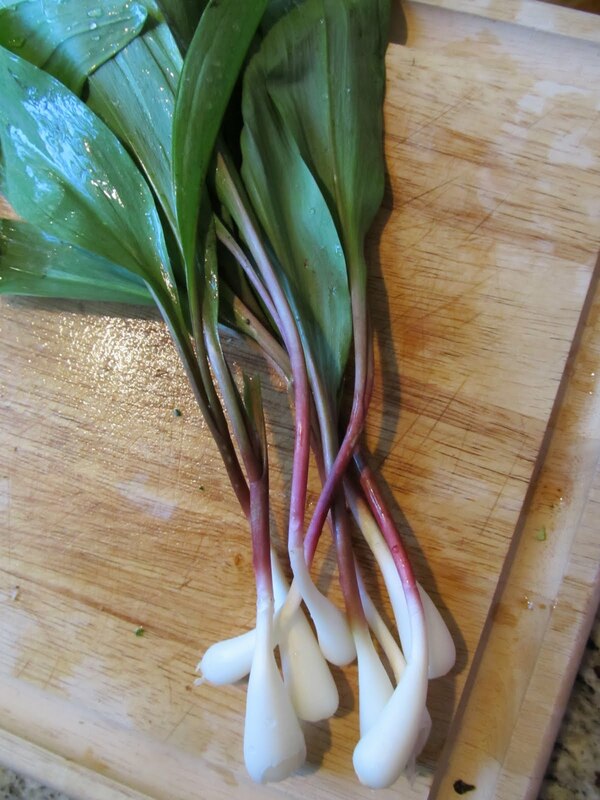 Today, I had the good fortune to split an order of ramps with my friend, Mandy – she had ordered 6 bunches and was more than willing to spread the wealth around a bit. 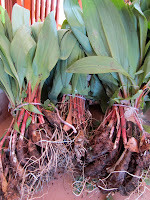 These ramps came to us via our weekly farmers market delivery and, truth be told, had Mandy not offered to split her order, I might not have dared to get some of these on my own. As a relative newcomer to the Carolinas, I am not familiar at all with these pungent little onions. I am positive that these are not readily available anywhere up north, however, I am so glad that I took the plunge! They are only in season for a short time each year – a harbinger for a more plentiful produce supply on the horizon. What a unique taste they have! The flavor is a little like a cross between a shallot, a scallion and garlic – a little sweet with a lot of kick and a little bit of a smell like my grandmother’s cellar. I had planned to layer some basil on my tomato and mozzarella slices and call it a day but when I saw these ramps I knew I had to try something with them right away. I recently read a recipe on Food 52 for Wild Ramp Pesto and it got me thinking… what harm could it do to throw a bunch of ramps and some olive oil into the food processor? The hardest part of the process of making ramp pesto was cleaning the ramps. As I mentioned above, these are locally grown – from the ground – real food has dirt, right? 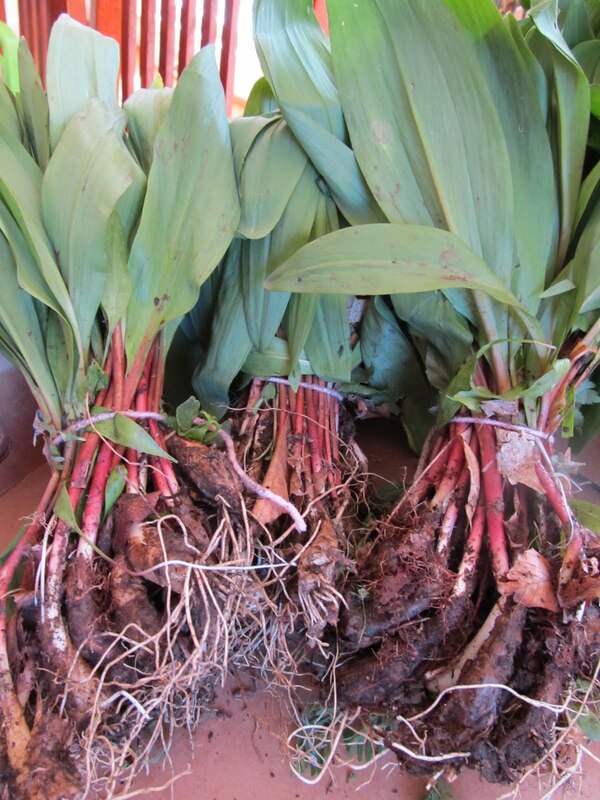 Just rinse the ramps off and peel off the loose outer covering of the bulb. I was able to snap the very tip of the root off with my finger – no knives required. Make sure that the grit is gone from between the leaves as you rinse the ramps under the water. Roughly chop the ramps and toss them into the food processor. Use the entire plant – I only discarded the hairy roots. Give it a few pulses and watch it turn bright green. Add in some olive oil. I used half of a large bunch of ramps – probably 12 or so were used to make this batch of pesto – so I gradually added in about a tablespoon of olive oil at a time. In the end, I probably used almost 3 tablespoons of olive oil. I seasoned the pesto with sea salt and pepper and then decided to throw in a handful of chopped pecans. Delicious. Pulse a bit more, scrape down the sides of the food processor, and transfer to a small serving dish. I found beautiful sourdough rolls nearby and couldn’t pass them up. I layered two slices of tomato and two slices of mozzarella on one side of the sliced roll and spread a heavy tablespoon of ramp pesto over the tomato and mozzarella. On the other side of the roll, I drizzled some red wine vinegar. The red wine vinegar softened the roll a bit and added a really nice flavor to the sandwich. Cut in half and serve! Enjoy. 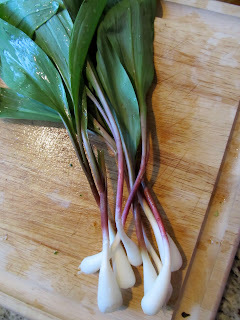 Ramps have a little kick … I wasn’t so heavy handed with the ramp pesto on the kids’ sandwiches!